Yep, I made nettles beer, and you can, too! We were drinking this very tasty beverage just two weeks after our afternoon foraging for stinging nettles. If you haven’t read any other home brew posts, I just want to remind you that I am a complete novice, and have just figured out how to do this on my own. Having some country brewing books is very handy (this is the one we have) and of course being able to look things up online is invaluable. Still, this process was very, very simple. It helps that I have a wild yeast that I grew at home, one that is very eager and assertive. This makes everything faster, more exciting, and fairly unpredictable. You could definitely order a commercial yeast to use, follow a recipe, and get much more predictable results– either way is great, the important part is to get out there, pick the free and health-enhancing nettles, and start brewing! Making beer with nettles is easier than you’d think, and yields a wonderful, gluten-free, ipa-style brew! In terms of supplies, there are a few basic items you should have. You can often find these on craigslist, and definitely at a brewing supply store, or you can order them on amazon. Keep in mind that you can re-use everything over and over again, once you have a few basics. Using gloves, wash the nettles thoroughly. Put two pots of water on the stove to boil. The second pot should have a generous four liters of (preferably filtered) water. With tongs, quickly blanch the nettles in the first pot, then drop them into the second pot. Once all of the nettles are in the second pot, boil them for 20 minutes to make the wort. Add the lemon juice and brown sugar to the wort, and let it cool. Pour into the (sterilized) fermentation bucket. Let it sit in the fermentation bucket for 2-3 days, and then pour it into sterilized demijohns, leaving the sediment in the bottom of the bucket. Add the yeast or yeast culture, and top with airlocks. Let the nettles beer sit in the demijohns in a place that’s not too cold and drafty. In 3-4 days, it’s time to “rack” the nettles beer, siphoning it into another sterilized demijohn, and again leaving the sediment behind. About a week later, when it not longer tastes sweet to you, it’s time to decant into bottles. Using swing-top bottles is really important, as there needs to be a mechanism for letting gas escape. Use a siphon hose to fill them up, leaving a bout an inch of space at the top. Let the bottles sit at room temperature for 2-3 days, and then try one, to see how the flavor and carbonation is doing. If it’s still sweet and under-carbonated, give it another day and test again. Once your Nettles Beer is where you’d like it, move them into the fridge, and enjoy! I have written out a much more detailed explanation of my process for brewing this beer, along with lots of extra tips and idea, below! Here is how I made Wild Nettles Beer at home. I took the big pile of nettles we had gathered, and rinsed them several times. I used gloves and tongs, and washed them in a bucket outside. I also poured some distilled vinegar in the tub to let them soak in, to help remove any unwelcome residues. After that, I set up two pots of water on the stove. I blanched the raw nettles in the first pot until they had wilted and lost their sting– about 30 seconds– and then put them in the big pot that I would use to brew my beer wort (tea, basically.) I blanched the nettles in batches, and once they were all in the big pot, I let them simmer for 20 minutes. Once the wort was brewed, I poured the tea out into the big bucket I had used. OK, let me stop right here and tell you that I sterilized everything. This is important. You have to sterilize the bucket, the bottles, the funnel– anything that will be touching the brew after it’s been boiled. It’s not hard— you can just buy home brew disinfectants that are made for this purpose. I tend to be a bit relaxed about this kind of thing in general, but I do sterilize. I let the nettles beer wort cool in the bucket. Some people let the mixture stay in the bucket for a few days before decanting into the demijohns. I got impatient and also didn’t like the plastic smell of the bucket, and wanted to get it out of there sooner. To make up for doing this early, I had to rack it again a few days later, since keeping it in the bucket would have allowed more sediment to settle and not make it into the jugs. Once it was cool, I put the liquid in the demijohn. There was extra, which I just poured into another glass bottle. I added the yeast culture, which was basically the dregs of an apple cider I had made a couple weeks before. This culture has lived many lives already, starting last summer as a strawberry kvass which picked up the cider yeast strain when I just covered it with fabric rather than putting an airlock on it. Since then, I have used it to make the blackberry “cider,” ginger beer, pear cider, and then most recently, apple cider from locally pressed apples. I always save some of the liquid and powdery stuff on the bottom to add to my next brew, and it has served me very well, so far! For basic instructions on getting a wild yeast of your own, look here. Alright, so I added the yeast culture, and then put the rubber cork and airlock on it. I brought it inside to put by our radiator, where the temperature is not at all hot, but just warmer than the rest of our drafty house. Within three days, the yeast was going kind of crazy. It kept overflowing, out through the airlock. I realize now that I probably should have left a lot more room between the liquid and the top of the bottle. Since I already had to rack it again, this wasn’t a big deal– I just sterilized a new fermenting jug and syphoned it out. With all of the overflow, I was able to also fit the liquid in that extra bottle, so it was all consolidated. I saved the last inch or so from each. Initially, I thought I would save this for another ferment, but the plastic lid kept blowing off of the jar, and so we drank that bit. At this point, the beer was definitely developing a beer-y flavor, but was just sweeter than we wanted. It was pretty promising, and there were clear hops-like flavors that we got excited about. About a week later, it was ready to decant into bottles. The timing was based on wanting more fizz and fermentation, but not wanting the mixture to run out of sugar to metabolize. So bottling it when it was just a little sweeter than I wanted, with some fizz going and a nice flavor was about right. After siphoning it into bottles, I put those back over by the radiator for three days, allowing the last bit of sugar to be turned into more alcohol and carbonation. We took the last bit of beer, leaving the lees (yeasty sludge)– some of which I have already added to my next brew, and put it into a couple of wine bottles and corked them. Because they contained more yeast culture than the rest, they developed really quickly, and became super fizzy within a day or so. As I said at the beginning, just two weeks after picking the nettles, we were drinking the homemade nettles beer! And I wish you could come over and try it, because it is really, really good! Both Jeff and I were surprised and impressed by the good flavor and the very beer-like character, all without any of the usual beer ingredients. Nettles totally work– and gave it a flavor similar to an IPA! And using brown sugar added some extra dimension. I totally recommend it. So, this is what it looks like: If you look closely, you’ll see that there is still yeast in the bottle, it just settles to the bottom. It’s nice and fizzy! I think we may go out foraging again this weekend, so we can start another batch! I also wanted to mention that after I cooked the nettles, I strained them and pureed them to use for cooking. We made a really nice Nettles & Roasted Garlic dip (like a traditional spinach dip) and I plan to use the ones I froze to make a nettles soup, and maybe a nettles version of saag paneer. Here are some more nettles recipes. So this experience of making nettles beer provided a really pleasant afternoon out gathering, plenty of greens to eat, and a wonderful beer! Have you ever brewed your own beer or wine? Do you think you’ll give it a shot? Did you like this post? Share it and pin for later! Share the post "Making Nettles Beer"
Wow! Fantastic. Definitely going to forage more nettles this weekend! Hazel, I will have to check out that book– I am not sure I’ve seen it yet. So fun! By the way, have you ever visited River Cottage? Just wondering why the need for airlock and demijons as I usually only use these when wine making. The furious fermentation process when brewing beer usually discourages contamination and provided all is sterilized there shouldn’t really be a need for them. Wow! Now I really can’t wait for the snow to melt. I’ve begun experimenting with honey mead and I will surely have to try this out too. 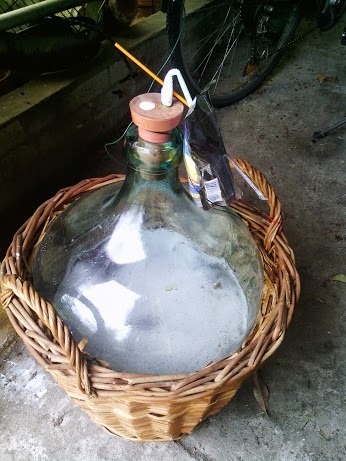 I skipped the mead-making, which is supposed to be the best introduction to home brewing– but I definitely intend to do some this summer, finally. You should definitely make this– it was not difficult, and has been such a great beverage. Of course, we are almost out now, and wishing we had made a bigger batch– but the nettles will be much thicker once the snow melts, so we’ll do more next time! Only if you think it’s OK for pregnant women and children to drink alcohol. This is an alcoholic drink, stronger than a regular beer, make no mistake! You should get a proper beer brewing yeast. You can find it at a brewing supply store, or online. It’s super cheap. Here’s one from amazon: https://amzn.to/X3qKAm . Gervin Ale Yeast gives nettle beer a great beer-y taste it also helps give a bit of head retention. Very intriguing!! We are certainly going to try this in the summer when our fields have nettles (so many nettles!). I haven’t eaten them either…though I love spinach so might try that too! Thank you!! Cait, youwill want to pick them by early June, when they are at their best. Don’t wait too long, they will be tough and less flavorful after spring. Also, just pick the top 5 leaves or so. THANK YOU SO MUCH! we have an abundant supply of wild nettle along the creek bank, this is very detailed and informative, I will definitely be trying this! Oh, you are welcome! I am so glad you’ll give it a shot! What a wonderful post and site! I have access to a LOT of nettles. I even had some come up in my garden and just left them so I could eat them. My family thinks I am crazy. Do you think that the sediment at the bottom of a home brewed kombucha would work for the yeast? Hi Rachelle, I’m glad you’re eating your nettles! I wouldn’t use the kombucha sediment. Instead, I would recommend that you buy some yeast– it is super cheap. I had someone else ask me the same thing yesterday. If you are in the US, here’s some you can order easily on amazon: https://amzn.to/X3qKAm . If you are in the UK, then you can pick some up at Wilkinsons or local health food shops. Thanks for the reply. My nettles are coming up fast! How long does the beer last after you bottle it? What happens in terms of fermentation and change of taste once you bottle it? ChantalMM, once you bottle the beer, you want to give it a bit of time to develop carbonation. But I wouldn’t keep it for more than a month or two in the fridge. I did this with a bottle of the apple cider, and it turned into something more like apple champagne– it tasted GREAT, but I lost most of it in an explosive fountain when I opened the bottle. Your beer will keep fermenting at a slower pace. This is another reason to use swing-top (grolsch-style) bottles, so they don’t explode with the building pressure. The swing-top caps can release tiny amounts of pressure over time, to keep that from happening. This is so fascinating! It combines my love of home brew AND of nettles! Thanks for the great idea! And if you ever need some home brew info, let me know! Thank you for the great tip! It worked out OK this time, since I was planning to rack it twice anyway, but that is very helpful! This looks really interesting Ariana! I love anything DIY and all natural…right up my alley. 🙂 Thanks for sharing this on Wildcrafting Wednesday! Hope to see you again today! Oh how I love this post so! We have been going nettle crazy, but I hadn’t thought to make beer from them. Sounds like a weekend project for Dear Husband and I 🙂 Cheers! Wow, this sounds great. Only thing is – I hate nettles. I fell in a patch when I was a child and have hated them ever since. But now that I hear you can make beer – well maybe I will just have to change my thoughts on nettles! I will show this to my hubby – maybe he will try it. Thanks for sharing. Found you on the Farmgirl Friday fest. I found you through ‘Homestead Survival’. Stinging nettles are a fantastic food. I used to buy them when I lived in Sarajevo. They are a tasty food in their own right. They grow all over the place in Europe. I don’t see them growing on the West Coast. Do they? Katja, I would google that… I lived in So California and in Oregon, and didn’t come across them. That doesn’t mean that they aren’t there– just that I wasn’t walking around the areas where they are most likely to grow. I hope you can find some! I didn’t notice a beginning S.G.
We’re new to beer making and like to go by-the-book. Do you know what your starting specific gravity was? Hello Rich, I did not check specific gravity. We have the gadget to do so, but I am kind of the opposite of you– less by-the-book and more by-the-seat-of-my-pants. So sorry! That’s so amazing! I had no idea you could make beer from nettles! We have yet to brew our first batch of beer, have only made cider so far, but I can’t wait to start! I hope you do try it, Meredith– we were so pleased and surprised by how well it turned out! I wonder if you could do this with water kefir somehow. Thanks for sharing at Wildcrafting Wednesday. Hi Jennifer. I think you could make a fermented tea beverage this way with water kefir, but I would use a cider yeast instead for a real country beer. This is fantastic! I am type 1 diabetic and my choices for low carb beer are dismal. Would this beer have many carbs in it after the yeast eats up the brown sugar? And could I add any spices? You could definitely add something like ginger, or coriander seeds. It would be worth a try! As for the sugar content, it’s so hard for me to know how much carbohydrate is left. You have some control over the process, and can let it get very dry. I would give it a shot, since it’s not grain-based and you are more able to taste the sugars left over, as opposed to non-sweet starch left in traditional beers. Good luck! I’ve just drunk the first bottle of the nettle beer I made with a friend after this recipe. I wasn’t sure if it would change anything that our nettles were already in full bloom, but apparently, that doesn’t matter. Here’s how it looked after a day and here’s the finished beer, two weeks later. I grew the yeast on a couple of overripe strawberries in a glass of water and it worked just fine. We’ve kept the dregs, right now the yeats gets to feed on some gooseberries to keep it alive, until we’ve figured out what to brew next. So thank you for that recipe, I doubt I would have tried stinging nettle beer of all things (and as a first homebrew experiment no less) if I hadn’t found it. Jedediah, thanks so much for reporting back! I am so glad you went ahead and tried it, and using strawberry for the yeast culture is perfect. Are you seeing a new growth of nettles in your area? I had thought the season was about over, since they had gotten to be about as tall as me– but there are new ones growing now, so I think we’ll take advantage! I would like to extend a few words on the working progress of laundry equipment manufacturers Hyderabad in India. How strong does the beer get? Should it be used within a month of initial brewing to prevent it from spoiling? When should i stop releasing the pressure in the bottles? And is ut ok to store it at room temp? Hi John, sorry I’m so late in this reply! The strength of the beer actually depends on the yeast. Since mine was a wild culture, I didn’t know what it would do. It ended up being *very* strong, but that is not typical of most wild yeasts. The beer will not spoil over time, but if there is more sugar to eat and it hasn’t reached the alcohol level that will cause the yeast to die, then you could lose a lot of the beer to the “geyser effect” when you open it. Storing in the fridge will slow this process down, so you might want to do that– but it’s OK to store at room temp, in terms of spoilage. How did yours turn out? Wow, this is so exciting! I used to be an avid brewer and still have all of the equipment, but as I can no longer eat (or drink) grains, I thought my brewing and beer drinking days were over. Thank you! GREAT! I hope you enjoy this beer! my husband and i have been brewing beer for 5 years now and have never heard of anyhting like this; no grains, no hops, skips so many steps. we can’t wait to try it out! Hey! I’m curious to know… as I’m new to beer brewing and it is brewing with plants like nettles that has me inspired, if you did anything between siphoning your nettle beer into bottles from your demijohn… I’m using to mixing in such items as corn sugar or honey to “carbonize” regular beers in my newness to brewing, so I’m guessing that the brown sugar or raw sugar used in the nettle beer recipe is enough to create a carbonated nettle beer after a week or so of the yeast breaking it down? No need to introduce anything else? Thanks! Hi there! I did not add anything– the trick was to bottle it just before it tasted as dry as I wanted– meaning that there was some residual sugar for the yeast to eat. I have done a lot more brewing after this project in the last few years, and there is definitely room to tweak as you go. I have added sugar to brews that got dry before I wanted, so it’s really up to you. But for this one, I have not needed to. And to think….i’ve only been using nettles to make pasta!! We’re going to try our hand at this beer this summer. So glad you could get a nice supply of nettles! I hope your beer turned out well, and thanks for sharing! Sounds just perfect to me! This is amazing!!!! I found your site randomly on pinterest and I’m already in love with it. Last year we made wine from wild grapes we picked in our local city park and it is amazing. really need to try this nettle beer. I’m bookmarking your site and will definitely be back to visit. If you’re interested, I live over at ImaginAcres blog, we run an urban farm and do a lot of foraging as well. So glad to meet you! Hi Meredith– glad you found this! Lucky you, finding wild grapes– that is fantastic! It’s always great to meet other urban foragers– we need to bring back traditional foodways. Hi Ariana. This nettle beer looks awesome, I have an abundance of nettles near me so really want to give this a go. One question though. How much yeast did you add and how much will the amount differ if I don’t use wild yeast ? Hi Ian, I added probably 1/4 cup of the yeast mixture, but this is really flexible because yeast will reproduce quickly. If using commercial yeast, you can use a packet or about a teaspoon or so. I may have missed it, but how much of your wild yeast did you put in your cooled wart? I have cultured ginger bug and naturally fermented hard cider dregs—- which one should I use for the wild yeast? I would use the hard cider dregs, Heather, and a tablespoon or so should do it. how much brewer’s yeast should I add? Oh no, got some floating mold on the top of my brew. What did I do wrong? Can I save it? Jamie, just scoop it off and continue to monitor. The smell should let you know if anything has gone terribly wrong, but a little mold on top does not spell doom. Hi Scott, there will definitely be some variations in how it comes out, based on the yeast you use. One trick is that once it’s about the dryness you would like, you can add a little sugar before bottling, to produce some carbonation. I am not a particularly precise person, but a little rummaging around on the internet should give you an idea of how much– I read 6.6 grams of sugar per liter. When I was a child there used to be a shop in Heysham, near Morecambe that sold Nettle Beer by the glass. It has been one of my favourites ever since. Apparently nettles were traditionally used as a flavouring and preservative in beer until some lads from a place called Rome turned up with something called hops in about 34 AD. They landed in Kent and planted their hops and hence it was the place where English hops were always grown and used for making beer in place of nettles. True nettle beer therefore uses maltose (i.e. malt), not sugar. This can be bought in grain form, but sparging to get the sugars out is a messy and somewhat unreliable pastime for a beginner so one is better using either malt extract (avoid any with codliver oil), or spray malt available from brewing shops. This is dried malt extract. One can also use brewing sugar that has a proportion of maltose in it (again from brewing shops). There is quite a bit of mystery in relation to how much sugar to use and how long to let it brew. You really need invest in a hydrometer and suitable hydrometer jar. Follow the instructions that come with it and make a note of the Original Gravity (OG), which is the reading before you add the yeast. Most brewing hydrometers will tell you how much sugar is in it per gallon and approximately how much alcohol is likely to be in your finished item. When fermentation stops take the final reading known as the Final Gravity (FG). If you deduct the FG from the OG and times it by 131.25 it will give you a reasonable figure of the ABV or Alcohol By Volume. For example, OG 1.040, FG 1.005. 1.040 -1.005 = 0.035 x 131.25 = 4.59375, or 4.6%. If you want a lower alcohol content, use less malt/sugar. You can always add more once you have taken the Specific Gravity and read off the likely ABV. You can’t take it out at this stage. My advice is always to let the beer stop fermenting (a small ring of static bubbles on the top is a good indicator) and then carefully rack it off the lees or yeast residue. The warmer the environment in which it brews, the quicker it will finish. Hence summer brews take less time. Bottle this and add 1 teaspoon of spray malt or sugar to each pint bottle. Leave it a week. When you then open it should give you beer with a decent head and not a fire extinguisher or a hand grenade. Like all aspects of life, things sometimes go wrong for even the most experienced brewer. If it goes wrong, use it as a trap for slugs in the garden and try again. Ariana! This is BEAUTIFUL! I just love this idea! Brilliant!